Hello again all you excellent fans of D-pad studio. Here’s another part to my process of level design. My buddy Jonathan wrote an excellent short article about his design process about 2 years ago. I found myself picking up lots of great tips from it and began applying it to what I was doing with Owlboy at the time. I won’t summarize him here as it only takes a few minutes to read, but his point was clear about shapes. Using Tetris pieces as a backbone to room design is pretty clever, they’re versatile shapes. He talks about using the environment to suggest things to the player. Also, the flow of your levels to make a strong narrative of levels and always keep themes running. I noticed something really cool about his game (Ninja Senki) being played by speed runners. The repeating shapes were akin to a racetrack for them to memorize so that the unique enemies could be strategized. A focused and versatile set of room templates will engage the player and allow them enough familiarity, yet also allows you to defy their expectations. Repeating room shapes are common in games, we need them to be or else every situation would be exhausting for both the player and the designer. Commonly these rooms are designed to suit a safe programming and design situation. Alice Madness Returns almost always summons enemies in large open platforms and walled rooms. Square platforms are easy to notice in jumping sections because of the regular shape and size. It becomes an expectation to find them, fight a few waves, and look for the next way up. Killing the enemies opens up the next path. Doing this allows the player to gain familiarity with the environment and instead focus on strategies for defeating the enemies. Abnormally shaped and dynamic rooms are used to test what you’ve learned. These combat boxes also serve as ways to control the player’s pace. If you were to block it out, the maps almost become squiggly lines between puzzle and or combat boxes. That would be oversimplifying it though and there is a lot to say about 3D space and room shapes that will have to wait. If it helps, you’re just working with layered rooms. Carl Sagan has all kinds of apple pie related wisdom on this subject and is damn good jumping point. In classic games you’ve probably seen plenty of common rooms for a purpose. The area before a boss fight is often different than the rest of the level and Megaman is well known for doing this, maybe starting it. The end of the stage meets a wall, an empty sealed corridor, and finally a closed and intimate space to focus on the boss. 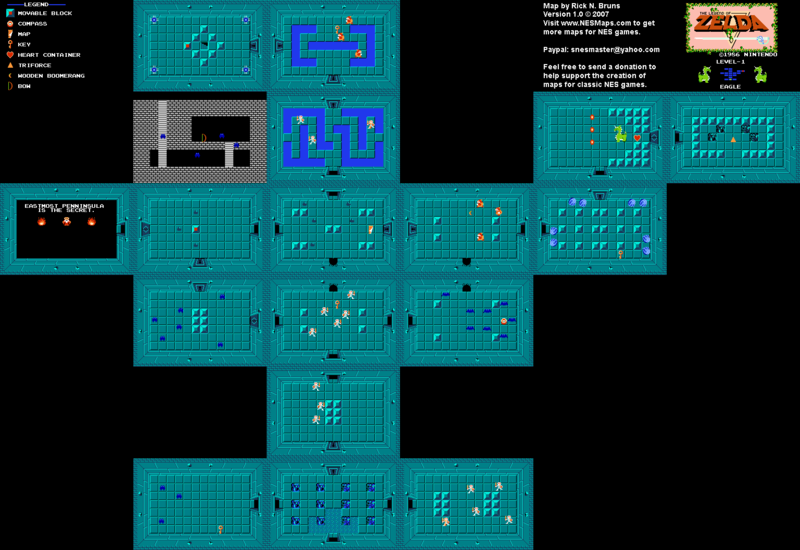 Tons of old games used boss rooms like this, and in a way it relates to my example of Alice. Boss fights are a confusion of patterns and phases at first sight. You needed to watch where every projectile fell, where the boss stood or what paths it would take. Bosses were complex compared to regular enemies and the room was supposed to be familiar. What I want to get into more is how the room shapes can quietly evoke a response from the player. Enemies tend to have a simple set of behaviours, they’re programmed to move around the environment and perform their laundry list of objectives when you’re nearby. The easiest way to set them up for a player to learn is usually in a straight line. With nothing in the terrain to bias the player’s experimentation they can just figure out what works. This is important because you will need to express your themes to the player with player advantages and disadvantages through enemies and obstacles. This is all highly dependant on your player mechanics so lets look at a few games including Owlboy. In Owlboy you can shoot in all directions. Because of this, the difficulty is getting a clean angle on your target. Uneven terrain like the Z block shape can hide enemies in a compact space. Twists and turns require the player to move to specific locations and those advantageous locations are sometimes protected. In contrast, a square room or straight hallway of any angle allows the player a clean shot. However, many enemies incorporate some form of protection and that provides conflict between the shape of the room and the angle of attack. Molts can’t be assaulted from the front, so they’re protected in a straight hall where your movement on a right angle is restricted. When you play the game of triangles, you win or you die. In 2D Mario games the player needs to gain a height advantage. Enemies are designed to be jumped on, so anything like an uphill slope or a climb adds difficulty. With each attack you can only defeat one enemy at a time and learning to bounce and keep your height allows you to dispose of them a little faster, but there’s always risk. In contrast, being at the top of a slope while enemies trudge upwards presents itself with a huge advantage. The feeling of sliding down the hill to destroy a group in a single stroke is fun and relieving. Vertical climbs and upward slopes provide the most difficulty to the jumping mechanic. What comes of this is tension and relief for the player as they experience the same behaviour in a different space. In part what happens is that the terrain signifies to the player what they should expect to tackle. An enemy might be presented in its most difficult to defeat position at the start and force the player to retreat, but later is found roaming around without any protection. It takes the tension away and this can be a good thing if you want to use it. There can be triumph at finally having the upper hand if the player has been regularly frustrated. If it’s done right the player should feel as if they fought their way into an advantage point, not that it was arbitrary like an invisible wall. The triumph could be soured on purpose though if that’s the feeling you want to get across. I love those moments in games when I can finally plow through enemies. Even in small aspects like sliding down in Mario. The satisfaction of mowing down 3 enemies at once doesn’t change anything about the game, doesn’t gain me anything, but I enjoy it so much. In classic Sonic games the same happens when I can ball up and freely roll downhill. I think this is because in both sliding and rolling there is a temporary invincibility granted as a reward for learning to play and surviving. It’s a break in the action to hurry you along the goal post express. What’s also great is when the game pulls a fast one on you (but not an ugly cheap death). There might be a spiked enemy or a pit or something. It keeps you on your toes, but too much of it expresses something very different than before. Early in the game it expresses carelessness. Forbidding the player from enjoy it later expresses seriousness. This is usually a good way to make the game feel more difficult at the end, but it can also kill fun and the player’s engagement. Ultimately I think that these games are designed to apply pressure and disadvantage through most of the basic room shapes so that the few remaining are elating. As a quick aside, look at Dark Souls (and Demon’s Souls). In a narrow hallway it would be stupid to do wide arcing swings, tactics require a thrust. Fighting up and down the stairs provide their own complexities with the wide variety of weapons. The shape of the room you’re in is of huge importance to the central mechanics of fighting. What I love about this game though is you can’t always be assured of an advantage or disadvantage just because of the familiar terrain. It does however play on what you might think you know about terrain and offers up many surprises. I think what also makes the use of repeating structures fun to play with is the surprise for your player. Players will clue in to established patterns as some enemies will always appear in a certain room shape. The shape of the room then sets an expectation for the player like the boss room. Sometimes a fresh experience will never appear, likely because it wasn’t fun to play in testing, or glitch on certain terrain, or there just wasn’t enough time. Regardless of fun sometimes it offers a refreshing surprise to be confronted with an underplayed situation. Variation in itself can be fun. I love secrets and a commonly played room is the vacant lot. There’s nothing in here to get you, nothing to distract you, so is there a secret door? Maybe. Or maybe it’s just a transition device, or maybe the surprise will drop down on you as you pass a certain point. The reasons for the empty room are numerous, it’s all about pacing. Here all of the room shapes built up by the player’s experiences are questioned. Let’s look at Zelda games since they’ve inspired so much of Owlboy’s design. Looking at the very first one you can see how every room is the same size, this is both for the world map and in dungeons. On the world map these repeating shapes establish a way for the player to map out where they’re at. The player will become aware of the grid pattern and the system of secret dungeon doors becomes obvious yet the exact details remain elusive. The original game can get away with a world devoid of hairline cracks and ruptures because it relies on the player to figure out the way with hints and reasoning with the maps. There’s clear markings in dungeons for doors, but the world map is far more cryptic. Later games are far from uniform and it would be a cruel game without help or a total focus on cyphers (like Fez). The other 2D Zelda games do use a mix of Tetris shapes but I’m trying to be brief. The old formula for secrets transplanted into a new game would require copious amounts of text or added mechanics so the easiest solution would be a crack in the wall. Zelda games use repeating microstructures in the terrain with different enemies or secrets. In later areas the circle of stones and the 4 equally spaced blocks signify the presence of a secret passage. Central barriers provide defensive strategies for enemies. Water rooms provide them with offensive strategies, forcing you to directly confront them to progress. This can be a good or bad thing depending on what the enemy does as an attack. Outside the dungeons are gridded statues and bushes and gravestones. The repetition invites inspection. Much the same as downward slopes in Mario and Sonic, I begin to hunt for rewards in the form of secrets. Relatively speaking, secrets and treasure are the rewards of enduring an adventure game. I get excited to try out what I know when I come across a room that resembles a secret. Back to Mario, some of the most famous secrets in Mario are about defying the room. Getting above the ceiling can lead you to warp zones and items. Again, the height advantage rewards the player. There’s a lot more to be said on the subject of how the shape of a room (and the terrain as I’ve worked it synonymously) contributes to the tension and relief of the player. I only use the terms together because once you divide up the traversable areas of a room, most fit these basic shapes. It’s not a rule I follow strictly, it’s just a way of understanding flow. I find that room shapes are more impacted by gravity than anything else. I think the reason for this is because gravity forces you to follow the terrain closely. It could be to do with the fact that everyone has to deal with gravity in life and it’s immediately relatable. I’m just speculating on this one though, unless you’re a wizard or magical beastling or hoverboard cyber-knight, gravity can be a problem in life. Really it depends on the player mechanics being used. Friction is probably the best way to describe what I mean, look at how games like Dark Souls work conflict between walls and player mechanics. It’s about figuring out what about your mechanics causes players to struggle and what makes them happy. You might find that by locating grief it can help you retool a space to be as hostile or as friendly as the themes of your game demand. Oh man, I made it through this whole article without a single Tommy Wiseau joke, Lisa would be proud of me if she didn’t betray me like everyone else. Haeh Haeh Haeh! Very awesome post. Really excited for Owlboy!! Thanks for the great article! Lots of stuff I was already wanting to do but didn’t fully understand why, as well as lots of stuff I hadn’t even thought about at all. This was a very helpful article.